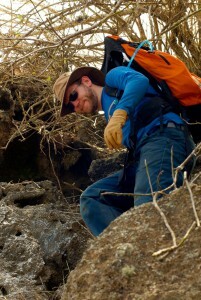 This week’s BEACON Researchers at Work blog post is by University of Idaho postdoc Andrew Kraemer. “When was the last time this island was searched for snails?” I asked as I picked my way through the loose cobble of lava rock. A 100-year gap between censuses is only one of the reasons I find myself looking for Galápagos snails (genus Naesiotus) during my postdoc with Dr. Christine Parent. Islands like Santa Fé, it turns out, are not particularly hospitable to snails. These islands are hot, dry, and often go through rapid shifts in climate. 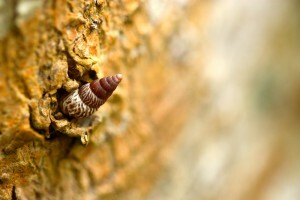 As a result, any snails found may be recent colonists from older, larger islands. Similarly, species found on the young volcanoes of the archipelago are also colonists. By comparing these young colonists to species found on older islands, we hope to learn more about the colonization process. After a long ascent, we finally climb onto the heap of boulders that constitute one of Santa Fé’s small peaks. While much of the island is hot and dry, clouds passing over sometimes drift low enough to bump up against these peaks. As a result, snails are able to eke out a living in the moist grass clumps that grow at the highest points of the island. On our trip to Santa Fé, we find 4 adults and a handful of juvenile snails of Naesiotus cucullinus. A small and tenuous population, but a live population nonetheless. 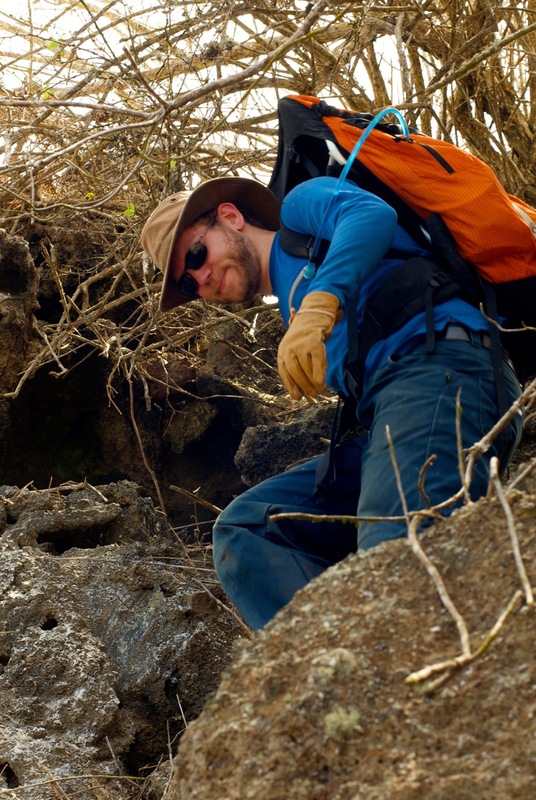 Through this research I am lucky to explore corners of Galápagos that few are given access to. As a result, we sometimes rediscover species long presumed extinct (e.g. Naesiotus rabidensis) or even find snails that do not correspond to any species previously described. Our research requires us to seek out these snails wherever they live, whether that is on a tiny island, the rim of a volcano, or at a construction site. We use a portable spectrometer to measure shell coloration in the field and collect empty shells to measure shell shape back in the lab. Previous research on these species has indicated that shell size and shape are tightly linked to local environment, and our recent work suggests that bird predators may direct the evolution of shell coloration. As for the colonist species, we are finding phenotypic similarities among species found on young volcanoes and among those found on small, relatively inhospitable islands. This could be due to rapid evolution after colonization or a filtering process that determines which species become successful colonists in the first place. We are currently constructing a new phylogeny of all Galápagos Naesiotus snails, living and extinct, that should indicate which scenario is most likely. Unfortunately, extinction is all too common in Galápagos and other Pacific islands. In particular, land snails like Naesiotus have been hit hard by many recent threats, including rats, invasive snails, habitat destruction, and even direct collection by humans. A reasonable question, then, is which species are we losing? Furthermore, why those species and not others? Another project I am working on will attempt to answer those questions for two snail groups (Galápagos Naesiotus snails and the tree snails of Hawaii), both of which have endured massive declines over the last 100 years. For this project I will visit several museums around the U.S. that have extensive snail shell collections. Using these collections and the records associated with them I will characterize distribution, shell size, shell shape, and shell coloration for each species. At the same time, my host lab (Parent) and a collaborator in Hawaii (the Holland Lab) will be expanding the phylogenies of each snail group using next generation and ancient DNA sequencing techniques. Together, we will find out if the catastrophic declines within these two major radiations are randomly distributed, or if the declines are funneling away the ecological and morphological diversity these groups are known for. The former result would be disturbing, but the latter result would prove ruinous for the evolutionary heritage of these two groups. The voyage of the Beagle and Darwin’s theory of natural selection ensured Galápagos would forever be a mecca for biologists, the truly astounding species make it a place worth studying, and the shocking recent declines of some of its fauna adds urgency to this work. My hope is that our research will contribute to the important conservation efforts of other scientists in the Pacific. For more information about Andy’s work, please see his website or email him at: akraemer at uidaho dot edu. This entry was posted in BEACON Researchers at Work and tagged BEACON Researchers at Work, Biological Evolution, conservation, Field Biology, Galapagos, genetics, next-generation sequencing, phylogenetics. Bookmark the permalink.